Business always wants more business, it’s the oxygen that keeps trade alive. The EU will not crumble, nor will the UK - business will survive on both sides. Trade deals are not easily made, there is a forest of bureaucracy and politics to navigate, e.g the plan of Liam Fox was to roll over existing EU deals with non EU countries. He said it would be easy in a no deal scenario. The plan was for 40 such deals by yesterday - he has 8 including with the Palestinian Authority and Faroe Islands. The easiest of these should have been CHF and so it was, they are the largest of the 8. Problem is that our astute politicians often forget that it’s business that conduct the deals and decisions on buying/selling never take account of politics. The Swiss deal in a no deal situation is useless, if in Switzerland I buy from UK tariff free under the Liam Fox agreement, then attempt to resell to my largest market - the EU - I will face sales tariffs - country of origin rules. 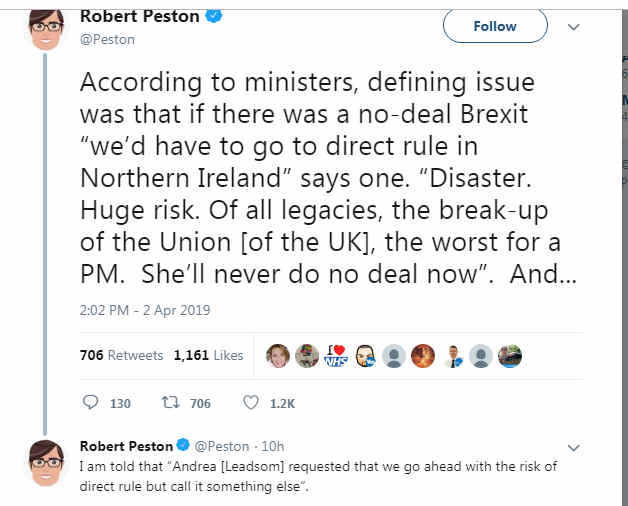 Perhaps an explanation of why the PM has changed from no deal vs bad deal etc. The chances of a no deal by default have increased quite substantially. Edit: Uk will not be able to reapply with GBP as it’s currency so the exit will be permanent when it happens. Thats pretty much true. the one good thing thats come out of it all is that now the general public know how much of a load of rubbish our members of parliment are. they are literally useless. we wont want to apply to get back in the Eu because it will crumble. Once the Uk leaves then the knock on affect will occur. Theres too much difference in the lowest economy providers and the largest providers in europe for the euro to survive long term. it will fall, even germany who are powerhouses are starting to decline, look ad the GDP and the bank rates. The uk are a big importer of many products across eurpoe, they wil want our business still,and new deals wil be made, mid to long term the UK will thrive. There is a lot of sense and truth in this post ! However, there is nothing I can argue with here either ! @peterma and I hold opposing views on the EU - basically because we are looking at different things ! He is clearly a very intelligent man with an agenda which revolves entirely around his personal wellbeing and prosperity - And who can argue with that ? We now have “May’s deal” as the only option the government will countenance - and it doesn’t seem to matter whether you talk to “Remoaners” or “brexiteers” - we all seem to agree that “May’s deal” is the absolute worst - worse than “Remain” and also worse than WTO terms ! Only 14% of the population are content with “May’s deal” it seems - I guess they are the one’s who shouldn’t really be let out in the streets on their own ! i gues withint he next month or so we wil find out what happens. i still stand by the fact the uk will be better off out of the EU than to stay in. Well it’s now in the open - ‘no deal’ seems to be off the table for the PM although no official explanation from No.10 as to why. One point though - was this predictable from a trading POV? - I posted on Sat re the change in tack by PM - Mon cable opened 3010 - this morning is 3185. What has happened after the referendum? But how bad will the short term be?